The Pratt St Underpass is still used by those without Overpass Permits and White Collar commuters. Much of the Real Estate downtown is owned by Hopkins-Krieger and that would be the massive Galleria Arcology. It is a seperate entity amongst the surrounding neighborhoods (and the underhoods...) having been sold to H-K by the City of Baltimore to recover from an economical deficit that the Federal gogernment wasn't interested in assisting with. They pretty much just slapped the arcology down where it stands, leaving many buildings underneath intact or close enough. This section has been named the Undercity by some clever folks in City Hall. In the afternoon shadow of the Arcology lies Government Plaza, a number of old stone buildings housing City Hall, the Federal Building, the Municipal and Federal Courthouses and City Council. The BCPD Headquarters (Central District) is located here as well. 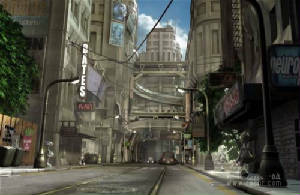 Despite the Arcology's presence, the Undercity is still used by people, there is little or no natural light on the street level, noxious gases drift up through the manhole covers which seperates the Undercity from the much neglected sewers. A number of the Arcology's Systems are controlled from facilities located down here, the waste management, emergency generators, water systems and air scrubber exhausts. The taller buildings were incorporated into the Arcology or destroyed to make room for the support system. The buildings that they did not own, the owner's quickly sold to Hopkins cheaply or they adapted to the horrible conditions. The inhabitants are a miserable lot, squatting in ruins or one of the many coffin hotels, there is no distinction between night and day besides the lack of any mass transit after 6pm. Even the BCPD pulls out of the area at night, leaving Knight Errant forces stationed at the 3 Undercity entrances to the Arco. 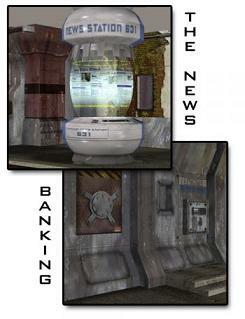 News, Banking, Access to the Matrix, all of these can be done from any street corner. The largest shopping and entertainment district in the city and the hottest spot for tourists, the hottest club acts and corporate wage slaves. Security is tight in public areas and even tighter in the private areas. Remember, you are not in the UCAS if you stray off the Overpasses, the Arcology is Hopkins property. This sports bar has 10 trids all with different baseball and football games on, recently on tuesday nights a small but growing Urban Brawl fanfare has begun to frequent the place. It has 8 different beers on tap and the fare is standard munchie style, anything fried and covered in cheese. This darkwave dance club is one of the hottest scenes amongst the cliquish Goth and Punk scene in Baltimore. The club has multiple floors, though the exact number is unknown, mostly because the only means of navigating the different levels is by using one of the many elevators. The elevators have a digtial input which goes from 1-999 and entering a three digit number will take you to a different floor. If you are meeting people on floor 323, you will find them on floor 323, no other. This is an obvious illusion of some sort, many Deckers have sought out the solution, however to this day it is just accepted that the Abyss has 999 floors. One of the most exclusive seafood restaurants along the bay which ironically sells very little locally caught seafood. Chef Cambell attended schools in Tokyo and the UK before buying this establishment 3 years ago. Dress to impress unless you have a reservation. The top of the Ivory Tower, you can not reach a higher point in the city, the view looks down on the city as if it were a collection of toy blocks to be built or destroyed. Well those that are able to secure a reservation to this restaurant are usually in that mindset, and authoritive position to do just that. The restaurant has the latest in anti-surveillance security, providing a safe and secure place for business meetings. Home of the Baltimore Ravens and Orioles, the Rash Field Pavillion hosts the Baltimore Pitbulls Urban Brawl Team. The area is lined with a number of Sport's Bars and recieves a great deal of traffic in part to the Arcology. The Camden Station provides access to nearly any place in the City by Bus, Train or Monorail, and it is also the main hub for the Mag Lev running into and out of the FDC.